trmdi updated the test plan for D20834: Remove the padding of BookmarksToolbarButton. trmdi requested review of D20834: Remove the padding of BookmarksToolbarButton. trmdi added a comment to T10809: Applets Scrolling when exceed the available space (maximum set length). trmdi committed R318:b7db272af2f2: Scroll to item if it's not visible on keyPress (authored by trmdi). trmdi closed D20152: Scroll to item if it's not visible on keyPress. trmdi updated the diff for D20152: Scroll to item if it's not visible on keyPress. trmdi added a comment to D20396: Don't show "Open With" menu items for empty directories. What happens if the user wants to open this directory with another program e.g. Dolphin (root mode), Krusader... ? Then they'll be using one of the file action plugins, e.g. 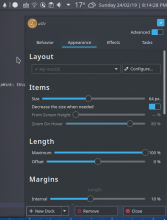 the "Root Actions" plugin. Also, this is not exactly an activity we encourage. trmdi added a comment to D20152: Scroll to item if it's not visible on keyPress. We always call KItemListSelectionManager::setCurrentItem() before calling scrollToItem(), so we should probably do it also here. I don't think it is needed because it was set in the above code block. Only if m_selectionManager->currentItem() != index, but this won't be true when the item is not visible. Which is why you want to move the scrollToItem() call outside this if() block in the first place, isn't it? trmdi added a comment to T10172: Protocol for external dock/panel apps to publish their geometries to Plasma. 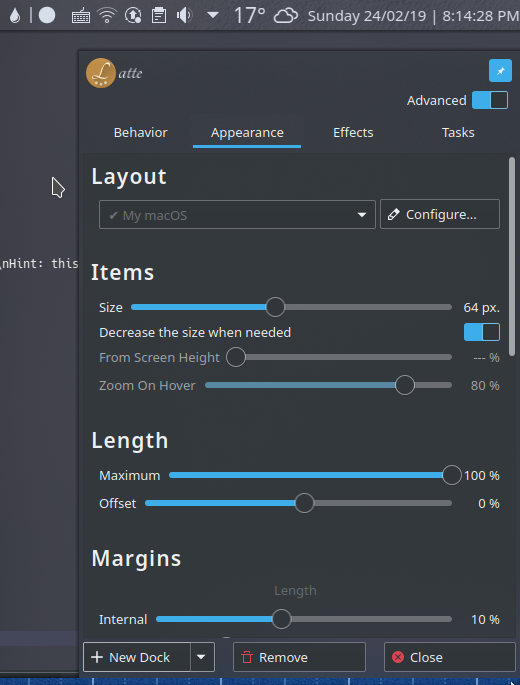 KRunner (Alt+F2) can somehow know about Latte and displays below Latte. Can you apply what Krunner does to the Folder plugin? trmdi added a reviewer for D20152: Scroll to item if it's not visible on keyPress: elvisangelaccio. trmdi abandoned D20249: Make the Configuration button more understandable. trmdi updated the diff for D20249: Make the Configuration button more understandable. trmdi added a comment to D20249: Make the Configuration button more understandable. trmdi updated the test plan for D20249: Make the Configuration button more understandable. trmdi requested review of D20249: Make the Configuration button more understandable. trmdi requested review of D20152: Scroll to item if it's not visible on keyPress. trmdi committed R878:5fe27176fa12: Center align shortcut badges when iconSize < 48 (authored by trmdi). trmdi closed D20128: Center align shortcut badges when iconSize < 48.
trmdi updated the diff for D20128: Center align shortcut badges when iconSize < 48.
trmdi added a comment to D20128: Center align shortcut badges when iconSize < 48. Can you explain more about the number 58? I choose 48 because I think it is the minimum size that center aligning still looks good. Checking the Badge height didn't work out well? trmdi updated the test plan for D20128: Center align shortcut badges when iconSize < 48.
trmdi requested review of D20128: Center align shortcut badges when iconSize < 48.
trmdi updated the test plan for D19893: [KickerDash] Add missed argument in addFavorite. trmdi added a comment to D19893: [KickerDash] Add missed argument in addFavorite. trmdi added reviewers for D19893: [KickerDash] Add missed argument in addFavorite: hein, Plasma. trmdi added a reviewer for D19893: [KickerDash] Add missed argument in addFavorite: ngraham. trmdi updated the diff for D19893: [KickerDash] Add missed argument in addFavorite. trmdi added a comment to T10714: Indicators New Architecture and Online Service. trmdi requested review of D19096: [Kicker] Fix "Tooltip can not be displayed". trmdi retitled D19096: [Kicker] Fix "Tooltip can not be displayed" from Fix "Tooltip can not be displayed" to [Kicker] Fix "Tooltip can not be displayed". trmdi retitled D19096: [Kicker] Fix "Tooltip can not be displayed" from Improvements for long label items in Application Dashboard to Fix "Tooltip can not be displayed". trmdi abandoned D19893: [KickerDash] Add missed argument in addFavorite. trmdi requested review of D19893: [KickerDash] Add missed argument in addFavorite. trmdi removed a reviewer for D19096: [Kicker] Fix "Tooltip can not be displayed": VDG. trmdi added a comment to D19096: [Kicker] Fix "Tooltip can not be displayed". Does this patch only concern itself with the icons and labels below them or also the categories on the right? If so, it feels like the category labels on the right are huge in comparison to the icon labels. Maybe those also need some touch up? trmdi updated the test plan for D19096: [Kicker] Fix "Tooltip can not be displayed". trmdi updated the diff for D19096: [Kicker] Fix "Tooltip can not be displayed". Update code style, only fix the tooltip bug. trmdi added a comment to T10274: Improve Dynamic Background options. trmdi added a comment to R878:aa83854b0344: fix liblatte2 faulty reference. Oh, I was about to ask you about this. Thanks for the fix ! trmdi updated the summary of D19800: [Application Dashboard] Improve mouse handler. trmdi updated the diff for D19800: [Application Dashboard] Improve mouse handler. trmdi added a comment to D19800: [Application Dashboard] Improve mouse handler. Ok, it will be fixed. While I can't get the bug to happen as often with this, I still can sometimes--especially when I drag the top-left-most item down one column. trmdi added a reviewer for D19800: [Application Dashboard] Improve mouse handler: Plasma. trmdi requested review of D19800: [Application Dashboard] Improve mouse handler. trmdi committed R878:432d6fb75349: Apply changes for tooltip from upstream (authored by trmdi). trmdi closed D19777: Apply changes for tooltip from upstream. trmdi updated the diff for D19777: Apply changes for tooltip from upstream. trmdi updated the test plan for D19777: Apply changes for tooltip from upstream. trmdi added a comment to D19777: Apply changes for tooltip from upstream. trmdi updated the summary of D19777: Apply changes for tooltip from upstream. trmdi requested review of D19777: Apply changes for tooltip from upstream. trmdi updated the test plan for D17073: [Task Manager] Do not crop album art in tooltip. trmdi added inline comments to D17073: [Task Manager] Do not crop album art in tooltip. trmdi updated the diff for D17073: [Task Manager] Do not crop album art in tooltip. Use Font.Bold for the song name. Increase the contrast between the song name and the artist. trmdi added a comment to D17073: [Task Manager] Do not crop album art in tooltip. Using a bigger font size means less characters could be displayed. I don't see what is more important between artist/song. I don't think the topMargin is needed because there is already a space between the song name and the cover image. Add 2px to leftMargin of track/artist. I don't set the margin of the Next button because it has its own padding. 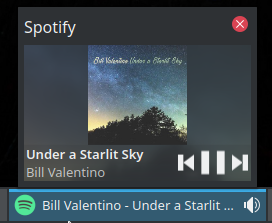 Resize the player icon when "minimized, we don't have a preview"
trmdi abandoned D17073: [Task Manager] Do not crop album art in tooltip. trmdi abandoned D19096: [Kicker] Fix "Tooltip can not be displayed". trmdi added a reviewer for D19096: [Kicker] Fix "Tooltip can not be displayed": broulik. trmdi added a comment to D19309: Improve Unity Indicator. @trmdi do you have commit access? trmdi requested review of D19309: Improve Unity Indicator. trmdi added a comment to T10522: Organizing Item's options. If you only hide it, what happens with users unchecked it before? How can they change it when they see the dock length exceeds the screen length? I think you should also replace plasmoid.configuration.autoDecreaseIconSize in every line that read it with true. Btw, should the "Decrease size automatically..." be always used instead of considering it as an option? Is there any case we don't want to use that option? trmdi added a comment to T10524: KWin Edges and Show Timer. What bug does this fix? Because those 2 sliders are never used at the same time, then why do we have to display both of them? trmdi renamed T10522: Organizing Item's options from Moving Item's "Decrease size automatically..." to Organizing Item's options. To me, they have the same importance as well as the attention. trmdi created T10522: Organizing Item's options. trmdi added inline comments to D19096: [Kicker] Fix "Tooltip can not be displayed". trmdi planned changes to D19096: [Kicker] Fix "Tooltip can not be displayed". What's all the unrelated code changes about mouse handling trying to achieve? Have you tested this with a few common screen resolutions / aspect ratios? The original grid was designed to try and avoid getting into awkward row configurations on common ones. Do not drag the item after right clicking on it. trmdi retitled D19096: [Kicker] Fix "Tooltip can not be displayed" from Improvements for long label items to Improvements for long label items in Application Dashboard. trmdi added a reviewer for D19096: [Kicker] Fix "Tooltip can not be displayed": VDG.